Seven media groups won “Grand Slam” honors in the annual Associated Press Sports Editors’ writing and sections contest that was held this week. The Boston Globe and Los Angeles Times, competing in the over-175,000 circulation division, earned top-10 recognition for their daily, Sunday and special sections to augment a top-10 website award in the category A division (over 2 million monthly unique visitors). The Indianapolis Star and The Seattle Times earned Grand Slam honors in the 75,001-175,000 circulation division and category B website (750,001-1.99 million unique monthly visitors). The Tulsa World won the Grand Slam in the 30,000-75,000 circulation division and category C website (250,000 to 750,000 monthly visitors), as did The Tuscaloosa News in the under-30,000 circulation category and the Wyoming Tribune Eagle in under-15,000. Both organizations competed in category D website (less than 250,000 unique monthly visitors). The APSE awards, voted on by sports editors from across the nation, honors work that was published in 2017. — Over 175,000 circulation: Chicago Tribune; Dallas Morning News; Minneapolis Star; Philadelphia Inquirer; The New York Times; The Washington Post. — 75,001-175,000: The Advocate; Omaha World-Herald; Pittsburgh Post-Tribune; The Buffalo News; The Oklahoman. — Under 15,000: Hattiesburg (Miss.) American; Laramie (Wyo.) Boomerang; Lubbock (Texas) Avalanche Journal; Marietta (Ga.) Daily Journal; Opelika-Auburn (Ala.) News. The Washington Post won nine writing/video awards. Bleacher Report and the Los Angeles Times won eight. The New York Times won seven. Bret McCormick of The Herald in Rock Hill, S.C., earned top 10 honors in feature writing, projects and long video, and teamed with other staffers to place in the top 10 in multimedia and short video. Erik Bacharach of the Daily News Journal in Murfreesboro, Tenn., won four individual writing awards in the under-30,000 circulation category. He placed in the top 10 twice in beat writing for the Daily News Journal and for his former employer, the Opelika-Auburn News. Bacharach also won top 10 awards for the Daily News Journal in explanatory and feature writing. 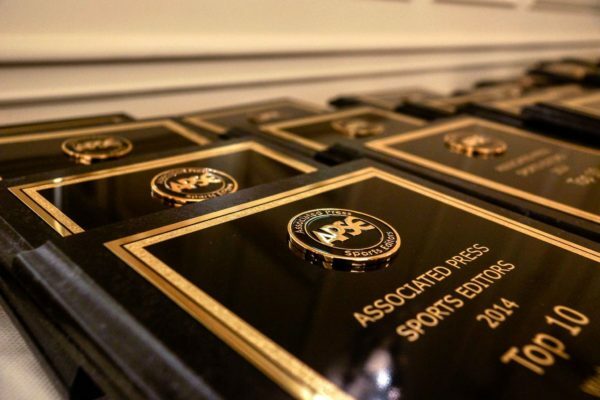 Winners will receive their awards in June at the APSE summer convention in Nashville, Tenn.
Burlington (Iowa) The Hawkeye, Charlottesville (Va.) The Daily Progress, Hattiesburg American, Missoula (Mont.) Missoulian, Murfreesboro (Tenn.) The Daily News Journal, Waterville Morning Sentinel, Wyoming Tribune Eagle. Laramie (Wyo.) Boomerang, Marietta (Ga.) Daily Journal, The Jackson (Tenn.) Sun, The Murfreesboro (Tenn.) The Daily News Journal, Wyoming Tribune Eagle. Dalton (Ga.) Daily Citizen, Denton (Texas) Record-Chronicle, Opelika-Auburn (Ala.) News. Altoona (Pa.) Mirror,Bloomington (Ind.) The Herald-Times, Casper (Wyo.) Star-Tribune, Elyria (Ohio) The Chronicle-Telegram, Lawrence Journal-World, Lubbock Avalanche-Journal, Marietta (GA.) Daily Journal, Opelika-Auburn News, The Tuscaloosa News, Williamsport (Pa.) Sun-Gazette. Burlington (Iowa) The Hawkeye, Charlottesville (Va.) The Daily Progress, Hattiesburg (Miss.) American, The Sun Journal (Lewiston (Maine), Sauk Valley Media (Ill.). The Beaumont Enterprise, Wilkes-Barre (Pa.) The Citizens’ Voice, Hattiesburg American, Lafayette Journal & Courier, Lawrence Journal World, Lewiston (Maine) The Sun Journal (Lewiston, Maine), Lubbock Avalanche-Journal, Opelika-Auburn News, Savannah Morning News, The Tuscaloosa News. The Fayetteville (N.C.) Observer, Laramie (Wyo.) Boomerang, Marietta (Ga.) Daily Journal, Sauk Valley Media (Ill.), The Tuscaloosa News, Williamsport Sun-Gazette. Lubbock Avalanche-Journal, The Beaumont Enterprise. Columbus Ledger Enquirer, Excelle Sports, Fort Collins Coloradoan, The Herald (S.C.), Kennebec Journal, Montgomery Advertiser, Steamboat (Colo.) Pilot & Today. Detroit News, Eugene (Ore.) Register-Guard, Green Bay Press-Gazette, The Clarion-Ledger (Jackson, Miss. ), Lexington Herald-Ledger, Portland (Maine) Press Herald, San Antonio Express-News, Tulsa World, Wisconsin State Journal, The Villages (Fla.) Daily Sun. The Canton Repository, Champaign (Ill.) The News-Gazette, The Charleston Post and Courier, The Des Moines Register, The Lexington Herald-Leader, Peoria Journal Star, San Antonio Express-News, The Santa Rosa Press Democrat, The State (Columbia, S.C.), Tulsa World. The Clarion Ledger (Jackson, Miss. ), The Harrisburg Patriot-News, Idaho Statesman, Montgomery Advertiser, Newport News Daily Press, The Roanoke Times, The Scranton Times-Tribune, The Spokane Spokesman-Review, The Villages Daily Sun, The Wisconsin State Journal. Canton Repository, Champaign (Ill.) The News-Gazette, The Gazette (Colorado Springs, Colo.), The Clarion-Ledger (Jackson, Miss. ), New Orleans The Advocate, San Antonio Express-News, Scranton Times-Tribune, Spokane (Wash.) Spokesman-Review, Tulsa World, Wisconsin State Journal. Bakersfield (Calif.), Eugene Register-Guard, Fredericksburg Freelance Star, Idaho Statesman, Peoria Journal Star, Roanoke Times, The Villages Daily Sun. Des Moines Register, Green Bay Press-Gazette, Idaho Statesman, The Greensboro News & Record (N.C.), Knoxville News Sentinel, Lincoln Journal-Star, The Palm Beach Post, The State (Columbia, S.C.), The Tennessean, Tulsa World. Champaign (Ill.) The News-Gazette, Dayton Daily News, The Clarion-Ledger (Jackson, Miss. ), Lafayette Daily Advertiser, Lexington Herald-Leader, Naples Daily News, The Advocate, Patriot News/Penn Live, Spokesman Review (Wash.), South Bend (Ind.) Tribune. The Advocate (Baton Rouge, La. ), The Buffalo News, Indianapolis Star, Milwaukee Journal Sentinel, Las Vegas Review-Journal, The Oklahoman, Omaha World-Herald, Philadelphia Daily News, Pittsburgh Post Gazette, The Seattle Times. Austin American-Statesman, Louisville Courier-Journal, San Diego Union-Tribune, The Salt Lake Tribune, The Tennessean. Arizona Republic, Austin American-Statesman, Cincinnati Enquirer, Louisville Courier-Journal, The Salt Lake Tribune. The Advocate (Baton Rouge, La. ), The Florida Times-Union, Indianapolis Star, Las Vegas Review-Journal, Louisville Courier-Journal, The Oklahoman, Omaha World-Herald, San Diego Union-Tribune, The Seattle Times, St. Louis Post-Dispatch. Boston Herald, The Buffalo News, Detroit News, FanRag Sports, The Florida Times Union, Indianapolis Star, Louisville Courier-Journal, Pittsburgh Post-Gazette, The News & Observer (Raleigh, N.C.), St. Louis Post Dispatch, The Seattle Times. Austin American Statesman, The Charlotte Observer, Cincinnati Enquirer, Orlando Sentinel, The Virginian-Pilot (Norfolk, Va.). The Boston Globe, Chicago Tribune, Dallas Morning News, Houston Chronicle, The Kansas City Star, Los Angeles Times, Minneapolis Star Tribune, The New York Times, USA Today, The Washington Post. The Boston Globe, Chicago Tribune, The Denver Post, Detroit Free Press, Houston Chronicle, Los Angeles Times, Minneapolis Star Tribune, The New York Times, The Philadelphia Inquirer, The Washington Post. Dallas Morning News, The Kansas City Star, Newsday. Baltimore Sun, The Boston Globe, Chicago Tribune, Dallas Morning News, Detroit Free Press, Los Angeles Times, Tampa Bay Times, Newsday, The Philadelphia Inquirer, San Jose Mercury News. The Kansas City Star, The New York Times, Orlando Sentinel,The Washington Post. Baltimore Sun, The Boston Globe, Dallas Morning News, ESPN, Los Angeles Times, Minneapolis Star Tribune, The New York Times, philly.com., Sports Illustrated, The Washington Post. The Denver Post, Houston Chronicle, Newsday, South Florida Sun-Sentinel, The Undefeated. Erik Bacharach, Daily News Journal (Tenn.); Erik Bacharach, Opelika-Auburn (Ala.) News; John Bohnenkamp, The Hawk Eye (Iowa); Travis Hines, Ames (Iowa) Tribune; Dylan Montz, Ames (Iowa) Tribune; Justin Pelletier, Sun Journal (Maine); Joel Reichenberger, Steamboat (Colo.) Pilot & Today; Brad Elliott Schlossman, Grand Forks (N.D.) Herald; Eric Shultz, The Citizens’ Voice (Pa.); Josh Vitale, Opelika-Auburn (Ala.) News. Brian Achatz, Pensacola News Journal; Mike DeFabo, The Anderson (S.C.) Herald Bulletin; Brad Elliott Schlossman, Grand Forks (N.D.) Herald; Cecil Hurt, The Tuscaloosa News; Shannon Marvel, American News (S.D. ); Sarah Rafique, Lubbock Avalanche-Journal; Matt L. Stephens and Kelly Lyell, Fort Collins Coloradoan; Brett Vito, Denton Record-Chronicle; Eric Wallace, Pensacola News Journal; Marc Weiszer, Athens Banner-Herald. John Bednarowski, Marietta Daily Journal; Drew Bonifant, Kennebec Journal (Maine); Mike DeFabo, Anderson Herald Bulletin (Ind. ); Travis Hines, Ames Tribune; Tim Fitzgerald, GoPowercat.com; Brandon Foster, Casper Star-Tribune; Tom Miller, Grand Forks N.D.) Herald; Scott Petrak, The Chronicle-Telegram (Elyria, Ohio); Matt L. Stephens, Fort Collins Coloradoan; Nicholas Talbot, Lubbock Avalanche-Journal. Erik Bacharach, Daily News Journal (Tenn.); Matt Bufano, The Citizens’ Voice (Pa.); Robert Gagliardi, Laramie Boomerang; Steve Gamel, Denton Record-Chronicle; Mike Graham, Lubbock Avalanche-Journal; Ian Murphy, Ames (Iowa) Tribune; Alex Resnak, Cherokee Tribune (Ga.); Jim Seimas, Santa Cruz (Calif.) Sentinel; Marc Weiszer, Athens Banner-Herald; Nubyjas Wilborn, Marietta (Ga.) Daily Journal. Erik Bacharach, Daily News Journal; (Tenn.) Nathan Baird, Journal & Courier (Ind. ); Ron Counts, The Daily Progress (Va.); Tim Fitzgerald, GoPowercat.com; Jeremiah Johnke, Wyoming Tribune Eagle; Ben Jones, The Tuscaloosa News; Bret McCormick, The Herald (S.C.); Andrew Ramspacher, The Daily Progress (Va.); Mitch Rupert, WIlliamsport Sun-Gazette; Luke Thompson, Yakima Herald-Republic. John Bohnenkamp, The Burlington (Iowa) Hawk Eye; Kyle Dawson, Aiken Standard; Brandon Foster, Casper Star-Tribune; Mike Graham, Lubbock Avalanche-Journal; Jane Allison Havsy, Parsippany (N.J.) Daily Record; Wil Kramlich, Lewiston (Maine) Sun Journal; Joel Reichenberger, Steamboat Springs (Colo.) Steamboat Pilot & Today; Chandler Rome, The Anniston Star; Brad Elliott Schlossman, Grand Forks (N.D.) Herald; Danny Schmidt, Marin (Calif.) Independent Journal. Robert Gagliardi, Laramie (Wyo.) Boomerang; Owen Hassell, Wilmington (N.C.) StarNews; Bret McCormick, Garrison Gist and Joe Koon, The Herald (S.C.); Staff, Sun Journal (Maine); Tommy Deas, Molly Catherine Walsh, The Tuscaloosa News. Autumn Allison and Colton Pouncy, The Leaf Chronicle (Tenn.); Scott Chancey, The Morning News (S.C.); Bret McCormick and Joe Koon, The Herald (S.C.); Jason Munz, Hattiesburg (Miss.) American; Daryn Slover, Sun Journal (Maine). Mark Emmert, Des Moines Register; Eric Hansen, South Bend Tribune; Aaron Kasinitz, Patriot-News/PennLive.com; Michael Lycklama, Idaho Statesman; Tom Orsborn, San Antonio Express-News; Will Sammon, Clarion-Ledger (Miss. ); Jennifer Smith, Lexington Herald-Leader; Cody Stavenhagen, Tulsa World; Ryan Thorburn, The Register-Guard (Ore.); Ryan Wood, Green Bay Press-Gazette. John Beauge, Patriot-News/PennLive.com; Brent Briggeman, The Gazette (Colo. Springs); Tyler Cleveland, The Clarion-Ledger (Jackson, Miss. ); Pete Dougherty, Albany Times-Union; Mark Giannotto, The Commercial Appeal (Tenn.); Steve Hanlon, Times of Northwest Indiana; Antonio Morales, The Clarion-Ledger (Jackson, Miss. ); Tony Paul, Detroit News; Will Sammon, The Clarion-Ledger (Jackson, Miss. ); David Teel, Daily Press, Hampton Roads (Va.). John Blanchette, Spokane Spokesman-Review; Geoff Calkins, The Commercial Appeal (Tenn.); Guerin Emig, Tulsa World; Mike Finger, San Antonio Express-News; Hugh Kellenberger, The Clarion-Ledger (Jackson, Miss. ); Aaron McFarling, The Roanoke Times; Austin Meek, The Register-Guard (Ore.); Tom Noie, South Bend Tribune; David Ramsey, The Gazette (Colo. Springs); Mark Story, Lexington Herald-Leader. Mark Berman, The Roanoke Times; Eric Hansen, South Bend Tribune; Aaron Ferguson, Peoria Journal Star; Michael Lycklama, Idaho Statesman; Dave Reynolds, Peoria Journal Star; Seth Soffian, The News-Press (Fla.); Cody Stavenhagen, Tulsa World; David Teel, Daily Press, Hampton Roads (Va.); Mike Vorel, South Bend Tribune; Ryan Wood, Green Bay Press-Gazette. Robert Anderson, The Roanoke Times; David Dorsey, The News-Press (Fla.); Mark Emmert, Des Moines Register; Mark Giannotto, The Commercial Appeal (Tenn.); Andrew John, The Desert Sun (Calif.); Brian Linder, The Patriot-News/PennLive.com; Godwin Kelly, Daytona Beach News Journal; Joey LoMonaco, The Free Lance-Star (Va.); Shad Powers, The Desert Sun (Calif.); Mike Vorel, South Bend Tribune; Cyd Zeigler, OutSports. Brent Axe, Lauren Long, Christa Lemczak, Ellen Blalock, Syracuse Media Group; Albert Cesare, Montgomery Advertiser; Justin Sellers, The Clarion-Ledger (Jackson, Miss. ); Rodney White, Des Moines Register; Dan Zampogna, Dave Jones, Salim Makhlouf, The Patriot News/PennLive.com. Staff, Lincoln (Neb.) Journal Star; Tony Paul, Adam Graham, Detroit News; Joe Sirera, News & Record (N.C.); Caitlyn Stroh, Alex Slitz, Jay Pilgreen, Matt Goins, Lexington Herald-Leader; Brant Wilkerson-New, News & Record (N.C.). Mark Giannotto, The Commercial Appeal (Tenn.); Ken Willis, Godwin Kelly, Daytona Beach News-Journal; Guerin Emig, Tulsa World; Greg Luca, McAllen (Texas) Monitor; Staff, The Canton Repository; Andrew John, Larry Bohannan, The Desert Sun (Calif.); Dan Fleser, Knoxville News Sentinel; Mark Story, Josh Moore, Lexington Herald-Leader; Adam Zuvanich, San Antonio Express-News; Frank Scandale, Mike Zacchio, Nancy Haggerty, Stephen Haynes, The Journal News (N.Y.). Alex Hawley, Adam Scigliano, Spencer Wardwell, Cyd Zeigler, OutSports; Salim Makhlouf, Brian Linder, The Patriot News/PennLive.com; Chris Pietsch, The Register Guard (Ore.); Michael Zamora, Des Moines Register; Anthony Zilis, The News-Gazette (Ill.). Zach Buchanan, Cincinnati Enquirer; Andrew Carter, News & Observer (N.C.); Michael Cohen, Milwaukee Journal Sentinel; Brett Dawson, The Oklahoman; Ross Dellenger, The Advocate (Baton Rouge); Andrew Greif, The Oregonian/OregonLive; Mike Harrington, The Buffalo News; Ryan O’Halloran, The Florida Times-Union; Brooke Pryor, The Oklahoman; Jay Skurski, The Buffalo News. Brett Dawson and Erik Horne, The Oklahoman; Craig Harris, Arizona Republic; Jon Heyman, FanRag Sports; Luke Johnson, The Advocate (Baton Rouge); Dan Kane, The News & Observer (N.C.); Tod Leonard, San Diego Union-Tribune; Sam McKewon, Omaha World-Herald; Stephen J. Nesbitt and Steph Chambers, Pittsburgh Post-Gazette; Mike Organ, The Tennessean; Michael Phillips and Paul Woody, Richmond Times-Dispatch. Joe Rexrode, The Tennessean; Tim Sullivan, Louisville Courier Journal; Berry Tramel, The Oklahoman. Dave Ammenheuser, The Tennessean; Geoff Baker and Hal Bernton, The Seattle Times; Rick Cantu, Austin American-Statesman; Michael Cohen, Milwaukee Journal Sentinel; Derrick Goold, St. Louis Post-Dispatch; Andrew Greif, The Oregonian/OregonLive; Bryce Miller, San Diego Union-Tribune; Kyle Neddenriep, Indianapolis Star; Tim Sullivan, Louisville Courier Journal; Jon Wilner, San Jose Mercury News/Bay Area News Group. Gary D’Amato, Milwaukee Journal Sentinel; Evan Bland, Omaha World-Herald; Jenni Carlson. The Oklahoman; Dirk Chatelain, Omaha World-Herald; Ross Dellenger, The Advocate (Baton Rouge); David Hall, Virginian-Pilot; Chris Heady, Omaha World-Herald; Jayson Jenks, The Seattle Times; Ed Miller, Virginian-Pilot; Tim Sullivan, Louisville Courier Journal. Courtney Cronin, San Jose Mercury News/Bay Area News Group; Adam Kemp, Tim Money, The Oklahoman; James P. McCoy, The Buffalo News; Mike Nyerges, Cincinnati Enquirer; Clark Wade, Indianapolis Star. Elizabeth Bloom, Andrew Rush and Zack Tanner, Pittsburgh Post-Gazette; Christopher Kamrani, Christopher Cherrington, Kevin Winters Morriss, The Salt Lake Tribune; Sean Quinton, Evan Webeck, Thomas Wilburn, The Seattle Times; Staff, Louisville Courier Journal; Staff, The Seattle Times. Dirk Chatelain, Omaha World-Herald; Gary D’Amato, Milwaukee Journal Sentinel; Ross Dellenger, David Ching and Luke Johnson, The Advocate (Baton Rouge); Bryce Miller, San Diego Union-Tribune; Staff, Indianapolis Star; Staff, The Tennessean. Jenni Carlson, Dave Morris, Greg Singleton, Todd Fraser, Tim Money, The Oklahoman; Mark Henle, Arizona Republic; Shelby Lum, Richmond Times-Dispatch; Staff, Louisville Courier Journal; Robert Willett, The News & Observer (N.C.). Howard Beck, Bleacher Report; Karen Crouse, The New York Times; Chuck Culpepper, The Washington Post; Anthony Fenech, Detroit Free Press; Adam Himmelsbach, The Boston Globe; Adam Kilgore, The Washington Post; Andy McCullough, Los Angeles Times; Jeff Passan, Yahoo!Sports; Pete Thamel, Yahoo!Sports; Scott Miller, Bleacher Report. Liz Clarke and Abby Phillip, The Washington Post; Liz Clarke, John Woodrow Cox, Mike Jones and Master Tesfatsion, The Washington Post; Jim Baumbach and Robert Brodsky, Newsday; Bob Nightengale, USA Today; Martin Rogers, USA Today; Rick O’Brien, Justine McDaniel, Aaron Carter, Philadelphia Inquirer; Rebecca R. Ruiz and Tariq Panja, The New York Times. Christine Brennan, USA Today; Jerry Brewer, The Washington Post; Greg Cote, Miami Herald; Martin Fennelly, Tampa Bay Times; Vahe Gregorian, Kansas City Star; Dave Hyde, South Florida Sun Sentinel; David Lennon, Newsday; Ian O’Connor, ESPN; Bill Plaschke, The Los Angeles Times; Mike Sielski, Philadelphia Inquirer. Michael Florek, The Dallas Morning News; Tom Haberstroh, Bleacher Report; Will Hobson and Steven Rich, The Washington Post; Andy McCullough, The Los Angeles Times; John Meyer, The Denver Post; Jeff Passan, Yahoo!Sports; Mary Pilon, Bleacher Report; Rainer Sabin, al.com; Seth Wickersham, Don Van Natta, ESPN; Brian Windhorst, ESPN. Eric Adelson, Yahoo!Sports; Lars Anderson, Bleacher Report; Kent Babb, The Washington Post; Sam Borden, ESPN; Mike DiGiovanna, Los Angeles Times; Nathan Fenno, Los Angeles Times; Andy McCullough, Los Angeles Times’ Jeff Pearlman, Bleacher Report; Josh Peter, USA Today; Mike Sielski, Philadelphia Inquirer. Mike Bianchi, Josh Robbins, Roger Simmons, Charles King, Jordan Krumbine, Orlando Sentinel; Robert Cassidy, Jeffrey Basinger, Chris Ware, Mark LaMonica, Megan Miller, Newsday; Jessica Q. Chen and Brian Van Der Brug, Los Angeles Times; Robert Clay and Lauren Sisler, al.com; Taylor de Lench and Scott LaPierre, The Boston Globe. Vahe Gregorian, Maria Torres, Jill Toyoshiba, Neil Nakahodo, Monty Davis, Kansas City Star; Joe Ward, Josh Williams and Sam Manchester, The New York Times; Andrew Keh, Gray Beltran, Sam Manchester, Joe Ward and Jeremy White, The New York Times; Priya Rishnakumar and Lance Pugmire, Los Angeles Times; Alex Speier, Matt Pepin, Michael Workman, John Tlumacki, Emily Zendt, Tonia Cowan and Matt Ellis, The Boston Globe; Michael Hogue, The Dallas Morning News; Reuben Fischer-Baum, Neil Greenberg and Mike Hume, The Washington Post; Staff, The Washington Post; Staff, The Boston Globe; Mark LaMonica, Ryan Gerbosi, TC McCarthy, Newsday. John Branch, Josh Haner and Dawa Finjhok Sherpa, The New York Times; Mike Jensen, Philadelphia Inquirer; Joon Lee, Scott Miller, Danny Knobler, Brandon Sneed, Dylan Lathrop and staff, Bleacher Report; Mark LaMonica, Greg Inserillo, Ryan Gerbosi, Megan Miller and Chris Ware, Newsday; Eric Moskowitz, The Boston Globe; Gary Myers, Christian Red, Kevin Armstrong and Evan Grossman, New York Daily News; Staff, ESPN; Staff, USA Today. Nancy Armour and Rachel Axon, USA Today; Bob Hohler, The Boston Globe; Danny Moran, Brad Schmidt and Lynne Palombo, The Oregonian/OregonLive; James Pilcher, Cincinnati Enquirer; Scott Reid, Southern California News Group; Rebecca R. Ruiz, The New York Times; Matt Stanmyre, Steve Politi and Andrew Mills, Newark Star-Ledger; Dan Wetzel, Pete Thamel and Pat Forde, Yahoo!Sports; Andrew Wolfson, Louisville Courier Journal; Christine Willmsen, The Seattle Times.